Have you ever wished your phone would just automatically silence itself while you're at work? Or maybe that it would immediately start Pandora when you plug in your headphones? Wish no longer: Tasker's got you covered. Tasker's goal is to automate (you guessed it) tasks on your Android device. This may sound a little trivial at first blush. But make no mistake, Tasker is anything but a trivial application. 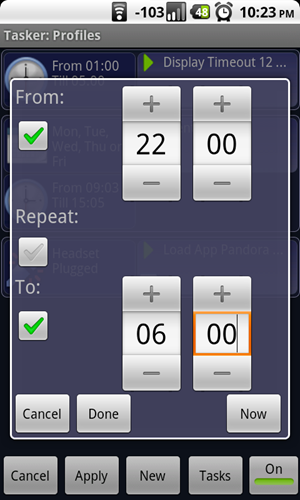 In fact, I can honestly say that Tasker is the single most feature-rich Android app I have ever used. 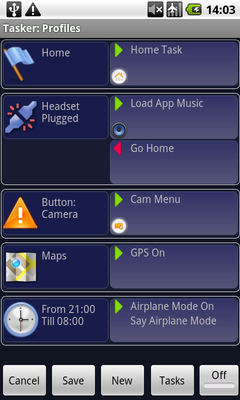 The number of potential scripts which could be made to run on Tasker is seemingly limitless. 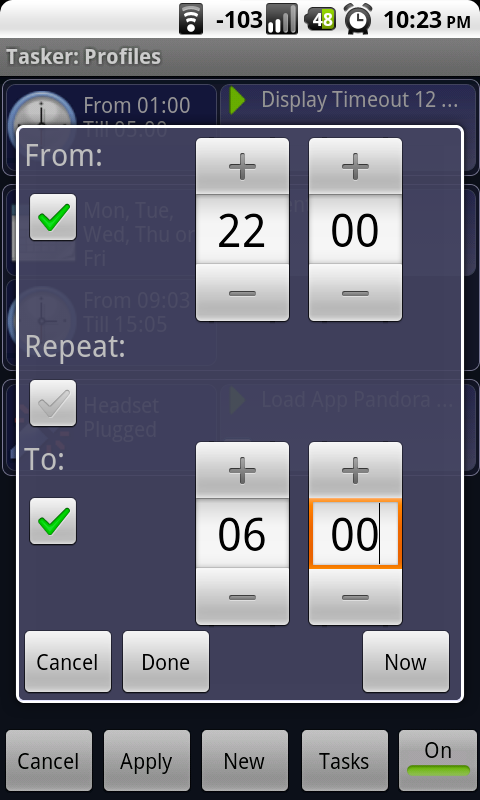 If you can imagine a recurring scenario, Tasker has probably got a way of automating behavior for it. How many apps can you now uninstall because they can be replaced by Tasker tasks? Probably quite a few. Pomp and circumstance aside, Tasker is just as capable of doing things which are relatively simple. I'll admit, Tasker is a complicated application to use when you're just starting out - especially for the less tech savvy among us. Have no fear, resources are in place to help you out. Tasker's profile wiki page has a number of common, popular profiles written by Tasker users. But, we'll go ahead and do a couple examples of our own just to show you that it's not quite as daunting as it may seem. So, you're the kind of person who enjoys your sleep. In fact, you enjoy it so much that you'd turn off your cell phone every evening if it wasn't for the fact that it also serves as your alarm clock. You usually silence your phone before bed, but sometimes (perhaps when coming home a little late), you simply forget to. Tasker to the rescue! To do this, simply open Tasker, and under profiles hit "New". From there, select the category "Time", and set a time frame (in this case, the hours where you're typically sleeping. Now you'll be sent to the task page. 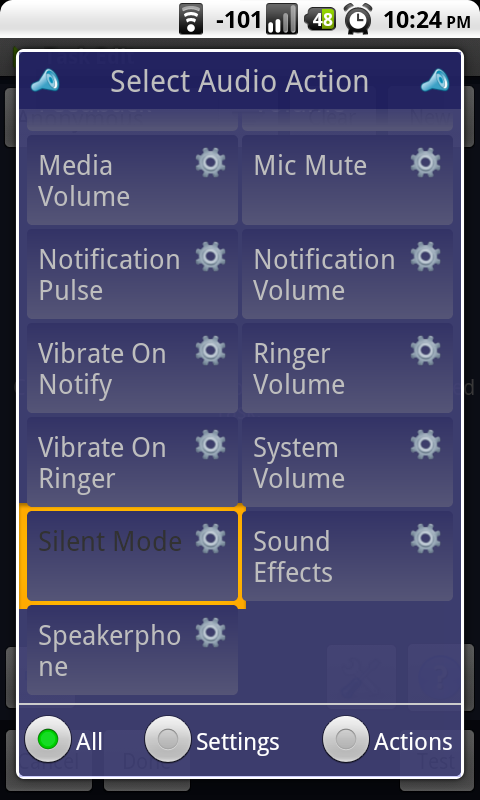 Hit the little "+" and select the "Audio" category, scroll down until you see "Silent Mode" and select it. Set the Mode to "On". Hit done, and then hit done one more time at the bottom of the tasks page. 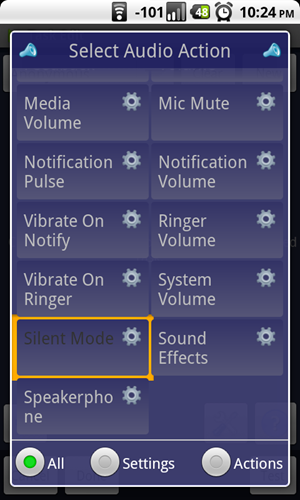 Ta-da, your phone will now automatically silence itself between the hours you've specified. You can also create a task with different hours and specific days of the week as well (using the "Day" category when creating a profile, then adding the "Time" category afterward), to silence your phone during work (or school) hours! This task is just as easy. Create another new profile, only this time, select the "State" category. 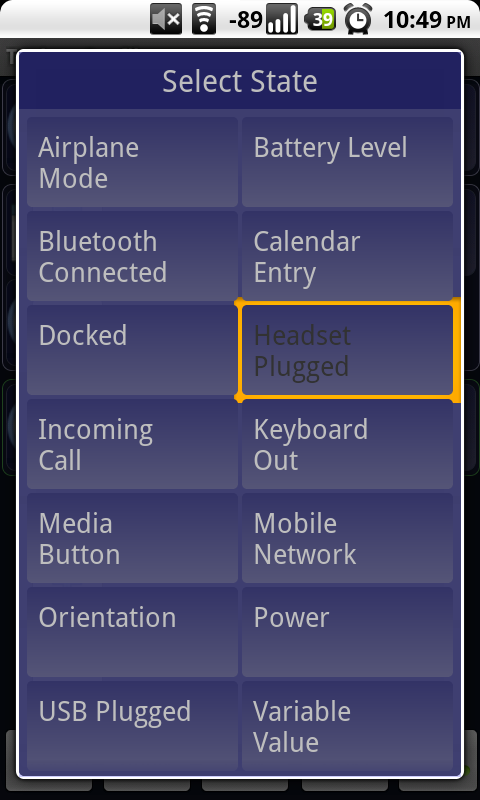 Under "State" you should find the "Headset Plugged" option, select it. 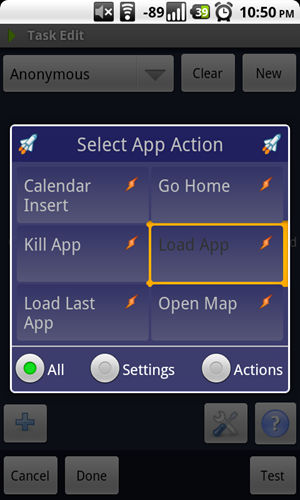 Now, create a task and select the "App" category. Select "Load App" and find Pandora (or whatever radio/music app you use) on the list. Done and Done. 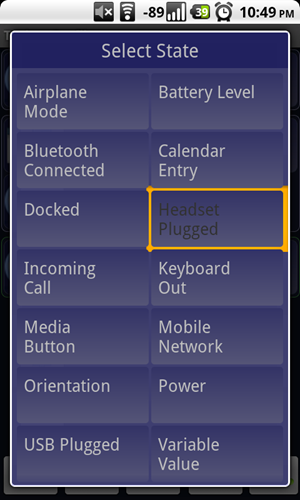 Now, whenever you plug your headphones in, the app you selected will automatically start! These are just 2 simple things Tasker can do for you; there are countless more (see here on how to launch a list of all your music apps when headphones are inserted), but we feel like you've probably gotten the idea here. during the night, turn on airplane mode to conserve battery/reduce radiation, but turn it off every 15 minutes to check for SMS/voicemail. In the end, Tasker's capacity to automate is limited only by your imagination. And as the list of community-contributed profiles grows, Tasker will only become more useful. If you have any trouble or questions about Tasker, there is a nice support forum available right here. The Tasker developer was kind enough to sponsor a giveaway of 20 free Tasker licenses. Emails have been dispatched notifying them of how to collect their winnings. Entering the contest is really simple - just make sure you complete the steps below. There are 2 parts in this step: complete either one of them to be eligible or both to double your chances of winning. Like/fan the AndroidPolice fan page, then Like the entry for this article. Fill out this form, so that we know who to contact in case you're a winner. In the comments below, tell the Tasker developer and the whole world what tasks you either want to or have already accomplished using Tasker. Again, steps 1 and 2 are required to enter. The contest starts immediately and runs until September 3rd, 11:59PM PST. Winners will be announced here and notified via twitter, Facebook, or email.